Yunnan Pu-erh tea is processed through kill green (sha qing), then dried in the sun - this arrests enzyme activity in the leaf allow the tea can be aged. 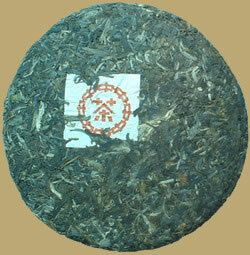 This raw Pu-erh cake with shinny luster and strong scent, taste smokey and with a sweet aftertaste. It is perfectly fine to drink as it is, and over the years the tea will even improve.